The interest in intratympanic treatment of inner ear disorders has substantially increased over the past two decades. While a PubMed search for the terms "intratympanic" or "transtympanic" produces just a few "hits" for any given year back in the 1990s,  for 2011 already more than 40 publications on the topic are listed - and this only counting those which deal with drug injections into the human middle ear. The rise in interest in this local drug delivery approach may be explained by our increased knowledge and understanding of inner-ear pharmacology and pharmacokinetics from animal studies. However, it probably also reflects a growing awareness among otolaryngologists of the advantages of local therapy for inner-ear disorders, and the increasing comfort level associated with its use. The intratympanic technique (i.t.) today is primarily used for second-line treatment of sudden deafness with glucocorticoids; chemical ablation of vestibular hair cells in Menière's disease with gentamicin; and tinnitus relief with, for example, lidocaine. The i.t. approach could open up promising new pharmacological treatment options, particularly, in the field of tinnitus therapy. One of its principal advantages is the ability to deliver therapeutic concentrations of a pharmaceutical agent in a highly targeted fashion to the affected inner ear, with only minimal systemic exposure, thus avoiding side effects on the unaffected ear and/or the central nervous system. This article aims to review state-of-the-art i.t. treatment of inner ear disorders and in particular, tinnitus, and to discuss its potential for broader use in this therapeutic field. The basic concept of i.t. therapy is fairly simple and straightforward: A drug with a target site of action inside the inner ear is injected into the middle-ear cavity, from where the active substance diffuses into the cochlea [Figure 1]. 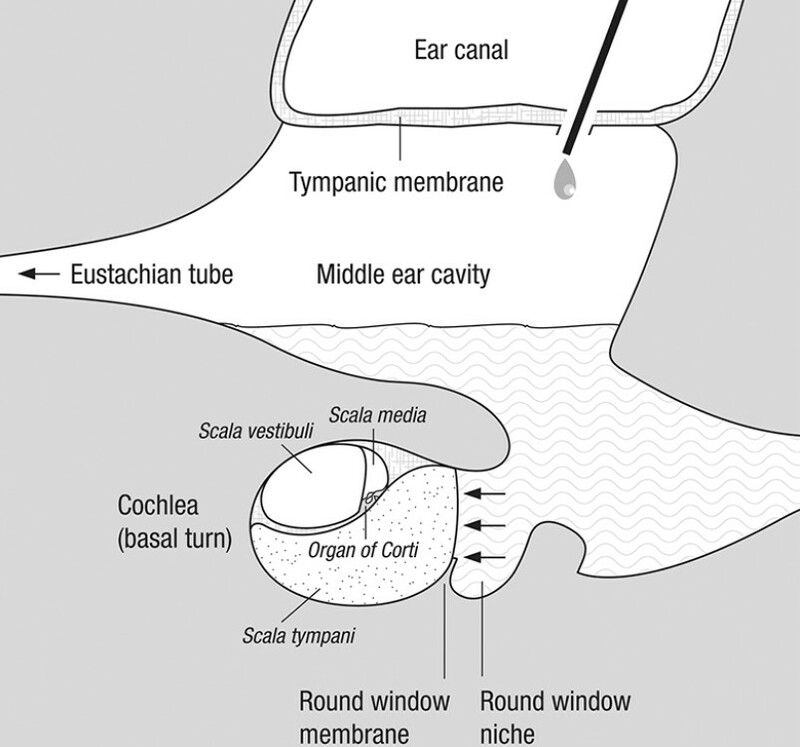 Diffusion occurs across the semi-permeable round window membrane (RWM), driven by the concentration gradient between the middle ear and the perilymph-filled scala tympani on the opposite side of the RWM. The diffusion rate is determined by various factors, such as size/molecular weight, configuration, concentration, liposolubility and electrical charge of the active substance, as well as by the thickness of the membrane. The smaller a molecule and the higher its solubility, the better it crosses the membrane - it will cross the membrane even more readily if, in addition, it has a positive electrical charge. The RWM consists of three layers: An outer epithelium facing the middle ear, a core of connective tissue, and an inner-ear epithelium bordering the inner ear. It is a tiny structure (the surface in humans measures 1.82-5.25 mm 2 ),  whose real function is the release of mechanical energy  in the form of hydraulic pressure. As sound waves enter the cochlea via the oval window and travel through the liquid-filled turns of the cochlea, their energy has to be dissipated somehow because a liquid is not compressible. Since the cochlea itself is embedded in the highly dense temporal bone and is thus not directly accessible, and as a cochleostomy for direct drug delivery entails a substantial risk of permanent damage, the RWM provides an attractive gateway to the inner ear. For the otolaryngologist, i.t. injections are a straightforward procedure. They can be performed under a microscope with the patient sitting reclined on the examination chair or lying on a stretcher. For the procedure, the patient's head is usually placed in a position tilted 45° towards the unaffected ear. This allows for the RWM to be at the lowest point of the middle-ear cavity, and the study medication to collect there and be in physical contact with the membrane. Patients are asked to remain in this position for about 30 min, allowing the active substance to diffuse into the inner ear. In order to avoid loss of medication into the nasopharynx through the Eustachian tube More Details, patients are also asked not to swallow, yawn, sneeze or speak. Following a brief explanation of the procedure to the patient, otoscopy of the ear canal and tympanic membrane is performed. Excessive earwax or debris is cleared and a local anaesthetic applied. Usually, EMLA cream (eutectic lidocaine/prilocaine mixture), xylocaine (4% lidocaine solution or 10% pump spray), or phenol are used. The xylocaine pump spray has a very short induction time of about 1-3 min, while EMLA cream requires 1 h. Phenol numbs the eardrum for up to several days. Once the anaesthesia has taken effect, any remaining anaesthetic needs to be suctioned off prior to the injection to avoid spillage into the middle ear, and avoid vertigo or dizziness. During all these preparations, the drug can be warmed up to about body temperature to prevent caloric vertigo. For the injection, various techniques and different materials are used. Typically, 1 ml syringes are used - preferably with a luer lock to prevent uncontrolled release of the needle while injecting. Frequently, a spinal needle is used, which may be slightly bent by hand, or a microsuction cannula. Preferably, a short bevel needle is used or, even better, one that is blunt. The injection is frequently performed via the posterior-inferior quadrant of the tympanic membrane, i.e., the area overlying the round window niche [left ear: about 3 o'clock, right ear: about 9 o'clock; [Figure 2], close to the limbus. Alternatively, the injection may be performed antero-superior. While i.t. treatments for sudden deafness or Menière's disease have been the subject of numerous pre-clinical and clinical studies, much less work has been done on their application in the field of tinnitus therapy. This is striking, since, in fact, the first modern attempt at i.t. treatment was, contrary to a widely held belief, not for Menière's disease, but for tinnitus. While Harold Schuknecht proposed the use of streptomycin in Menière's disease as an alternative to surgical labyrinthine ablation in 1956,  it was actually Barnard Trowbridge from the University of Kansas School of Medicine in Kansas City who initiated the use of i.t. treatments for tinnitus in the 1940s. In 1944, Trowbridge wrote a short report, and then in 1949 a detailed paper, on the i.t. treatment of tinnitus with morphine. , His treatment protocol consisted of repeated i.t. injections of 0.25 ml of a 5% ethylmorphine hydrochloride solution at 4-day intervals using, essentially, the technique that is still applied today. Trowbridge had observed that tinnitus and otalgia often appeared together, and ascribed this to inflammation of the tympanic plexus. With ethylmorphine hydrochloride, an analgesic and vasoactive substance, which at that time had already been used in ophthalmology for removing inflammation products from the eyes, he sought to "calm" the tympanic plexus, thus suppressing tinnitus, and rehabilitate middle-ear tissues. Trowbridge treated 20 patients and claimed complete tinnitus relief in 11 of them, partial improvement in seven and no change in the remaining two: Best results were seen in unilateral peripheral tinnitus up to 1 year from the onset of the tinnitus. Since no control group was included in Trowbridge's study, it is not known whether there was any real therapeutic benefit. J.F.O. Mitchell from the Royal Infirmary in Edinburgh, UK, failed to replicate Trowbridge's results shortly after their publication, reporting no improvement in the majority of subjects (seven out of 11), and only a slight and transient improvement in the others. However, only four of his subjects suffered from peripheral tinnitus with onset up to 1 year before the conditions best suited for the treatment according to Trowbridge. Since no other references to Trowbridge's therapy can be found in the literature, we must presume that it fell into oblivion. More than 10 years before Trowbridge published his results with i.t. morphine treatment, Nobel Prize winner Robert Bárány of the University of Uppsala, Sweden, had discovered serendipitously that tinnitus was occasionally suppressed in some patients for a variable length of time when procaine, a local anaesthetic, was administered during intranasal surgery. This clinical observation prompted Robert Lewy of Chicago in 1937 to perform the first study of the use of local anaesthetics for tinnitus relief in 1937, using 75 subjects. Following i.v. administration of procaine, dibucaine or quinine combined with urethane, he observed tinnitus suppression or attenuation in the majority of cases, with effects lasting between a few minutes and a few weeks. From Trowbridge's work, it took several decades for the concept of i.t. tinnitus therapy to resurface. Firstly, lidocaine, another local anaesthetic which acts as a sodium-channel blocker, was tested by several groups in the treatment of Menière's disease by way of systemic administration. , Then, in the 1970s, Eiji Sakata of the Saitama Clinic in Japan started administering lidocaine and dexamethasone intratympanically. , Since lidocaine has a cardiac depressant effect, giving rise to safety concerns, local administration seemed to offer a much better risk/benefit ratio. For i.t. lidocaine, Sakata reported that tinnitus diminished in 48 of 58 patients (82.8%) after i.t. injection. Besides finding the right molecule, the development of future tinnitus therapies based on i.t. injections will also have to address a number of anatomical and physiological factors that tend to produce variability in therapeutic outcomes. Probably, the most important source of variability arises from the fact that the RWM is anything but a standardized "drug delivery port". Its thickness (on average 70 μm) and, especially, its size varies widely in humans  and in some cases, it is also covered or obstructed by an extraneous "false" membrane stretching across the opening of the niche in front of the RWM, or by fibrous or fatty plugs within the niche itself. A drug may thus diffuse much better into the inner ear of a patient with a thin RWM, which has a large surface area than in another patient, whose RWM is covered by a dense false membrane, resulting in substantial differences in perilymph concentrations. Once the pharmaceutical agent has been absorbed into the inner ear, another source of variability comes into play in the form of a concentration gradient from the basal turn of the cochlea (the location of the RWM) to the apex. Distribution of drugs within the perilymph-filled scala tympani of the cochlea is dominated by passive diffusion, with slow substance movement and increasing loss through distribution into adjacent fluid spaces and tissue compartments, and elimination along the length of the cochlea. Animal data shows basal-apical concentration differences of over 1000-fold. However, this cannot be generalized to humans easily due to important anatomical differences. While direct determination of the gradient in a human cochlea is usually not feasible, it has been estimated in a computer-based simulation for i.t. gentamicin at around 100:1 (basal to apical levels). Such a gradient can be of importance if a drug has concentration-dependent side effects in the inner ear, e.g., reaching a target concentration at a more apical target site may require the administration of a dose that is ototoxic in the basilar part. For the development of i.t. tinnitus treatment, various conclusions can be drawn from the aforementioned sources of variability. First of all, it is evident that, for safety reasons, i.t. injections are best suited for drugs with a wide therapeutic range. Secondly, i.t. treatments targeting a site of action in the basal part of the cochlea, i.e., in the higher hearing frequencies, are easier to accomplish than therapies with a site of action in the apical part. This means, for example, that the feasibility of i.t. treatments for noise trauma or inner-ear tinnitus, which most often affect high-frequency regions of the cochlea, is a priori more easily given than those for Menière's disease, which affects the low frequencies. Thirdly, if the target site of action is located in the middle or apical turns of the cochlea, continuous perfusion or repeated i.t. injections may be required to raise concentrations high enough. Fourthly, when evaluating the dose response effect of an i.t. treatment, larger dose-step increments than the factors (×2 or lower) commonly applied in dose escalation studies should be used. In order to obtain clear signals, a factor of 3 seems much more appropriate; this factor is frequently used in dose escalation studies with intranasal drug application to take account of the variability in absorption through mucosal tissue. The anatomical differences in RWM size and thickness, as well as the existence of basal-apical concentration gradients, cannot be removed as sources of variability. The process of drug delivery, however, offers various possibilities for optimization. Formulations or devices that ensure retention and facilitate physical contact with the RWM are preferable to solution-based formulations, which can easily get lost through the Eustachian tube. This may be achieved by injecting viscous gel formulations, or by placing wicks, microcatheters or drug-eluting implants (stabilizing matrices)  into, or close to, the round window niche. The latter approaches typically require more invasive administration procedures than i.t. injections, and are beyond the scope of the present review. For patients, i.t. treatments are attractive if they allow for short, effective therapies with fewer drug side effects than with systemic administration, and if they don't entail unacceptable procedure-related side effects. Most patients understand the concept of i.t. injection, and readily accept the proposed therapy,  recognizing the benefits of a targeted treatment. Compared with infusion therapy, which sometimes even requires hospitalization, i.t. therapy is certainly much shorter and can be performed on an outpatient basis. The whole procedure, comprising otoscopy, local anesthesia of the eardrum, preparation for the injection, drug administration and the following resting period, takes less than one hour in the hands of an experienced otolaryngologist. A healthy tympanic membrane should close quite rapidly, although data on cicatrisation times are hard to find in the literature. From discussions with otolaryngologists, it would seem that closure can be expected in the majority of cases in between 2 and 5 days. 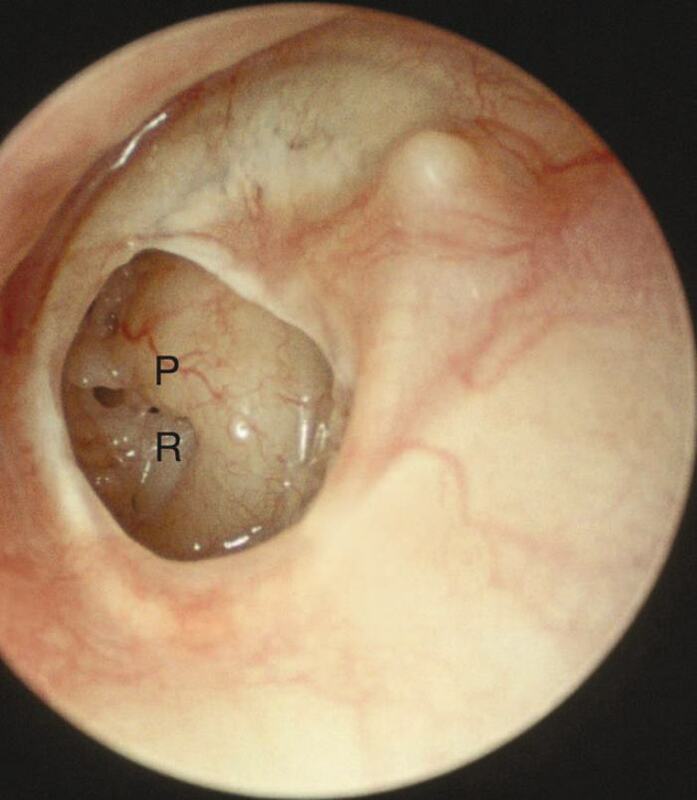 In a small study involving single-dose injection through a paracentesis (and following otoendoscopy), the tympanic membrane was found to be closed 7 days later in 21 out of 24 patients. 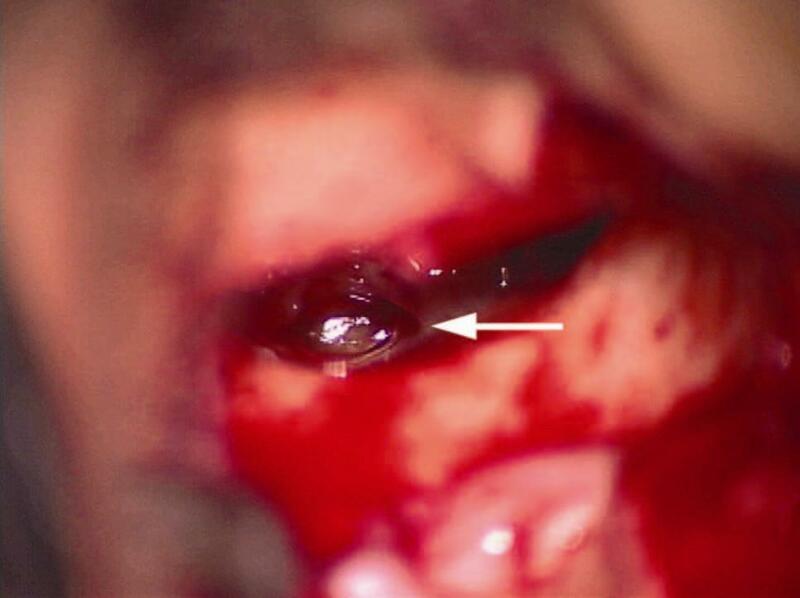 Sometimes a small blood crust from wound healing will remain on the tympanic membrane: It will either fall off after some time or may be removed by the otolaryngologist. Where there has been repeated drug administration, subsequent injections are preferably performed at the site of the initial tympanopunction, respectively paracentesis. As long as the tympanic membrane is open, the patient should avoid exposing the treated ear to water. Following the treatment administration, the otolaryngologist should remind the patient that once he or she gets up small quantities of the study drug may drain down the Eustachian tube and the nasopharynx, and that the perception of sound, including pre-existing tinnitus, may change while the eardrum remains open. The use of i.t. injections seems conceptually well suited for the treatment of inner-ear disorders such as peripheral tinnitus thanks to the highly targeted delivery of medication to the cochlea. Systemic exposure is minimal, the procedure is simple and straightforward to carry out, and usually well tolerated in patients. Appropriate information prior to the procedure, the use of fine needles and adequate local anaesthetics with short induction times, a gentle flow rate and moderate injection volumes, as well as a sufficiently warmed drug, reduce the likelihood of adverse events, and enhance patient acceptance. The variability in intracochlear drug concentrations can be addressed at least partially through formulation development, in particular, the use of gels. Still, important groundwork has been done. The numerous lidocaine experiments have proved that tinnitus can indeed be modulated pharmacologically, although the mechanism of action through which tinnitus suppression is achieved still remains a mystery. The quest for the discovery of effective and safe therapeutic molecules is continuing, and with the ongoing increase in scientific tinnitus research, and a growing involvement of the pharmaceutical industry, it seems highly likely that i.t. therapy for tinnitus will come of age in the not-too-distant future. The author would like to thank Wolfgang Arnold for his valuable suggestions and comments, Béatrice Haller for the artwork and Sara Oakeley for editing. Special thanks go to the two anonymous reviewers for their very helpful comments. 1. Lustig LR. The history of intratympanic drug therapy in otology. Otolaryngol Clin North Am 2004;37:1001-17. 2. Goycoolea MV, Lundman L. Round window membrane. Structure function and permeability: A review. Microsc Res Tech 1997;36:201-11. 3. Goycoolea MV. Clinical aspects of round window membrane permeability under normal and pathological conditions. Acta Otolaryngol 2001;121:437-47. 4. Nomura Y. Round window membrane. In: Pfaltz CR, editor. Otological Significance of the Round Window. Advances in Oto-Rhino-Laryngology. Vol. 33. Basel: S. Karger AG; 1984. p. 38-74. 5. Jahnke K. The blood-perilymph barrier. Arch Otorhinolaryngol 1980;228:29-34. 6. Niedermeyer HP, Zahneisen G, Luppa P, Busch R, Arnold W. Cortisol levels in the human perilymph after intravenous administration of prednisolone. Audiol Neurootol 2003;8:316-21. 7. Bird PA, Begg EJ, Zhang M, Keast AT, Murray DP, Balkany TJ. Intratympanic versus intravenous delivery of methylprednisolone to cochlear perilymph. Otol Neurotol 2007;28:1124-30. 8. Haynes DS, O'Malley M, Cohen S, Watford K, Labadie RF. Intratympanic dexamethasone for sudden sensorineural hearing loss after failure of systemic therapy. Laryngoscope 2007;117:3-15. 9. Gouveris H, Schuler-Schmidt W, Mewes T, Mann W. Intratympanic dexamethasone/hyaluronic acid mix as an adjunct to intravenous steroid and vasoactive treatment in patients with severe idiopathic sudden sensorineural hearing loss. Otol Neurotol 2011;32:756-60. 10. Topak M, Sahin-Yilmaz A, Ozdoganoglu T, Yilmaz HB, Ozbay M, Kulekci M. Intratympanic methylprednisolone injections for subjective tinnitus. J Laryngol Otol 2009;123:1221-5. 11. Takahashi H, Sando I, Takagi A. Computer-aided three-dimensional reconstruction and measurement of the round window niche. Laryngoscope 1989;99:505-9. 12. Salt AN, Plontke SK. Principles of local drug delivery to the inner ear. Audiol Neurootol 2009;14:350-60. 13. Muehlmeier G, Biesinger E, Maier H. Safety of intratympanic injection of AM-101 in patients with acute inner ear tinnitus. Audiol Neurootol 2011;16:388-97. 14. Rauch SD, Halpin CF, Antonelli PJ, Babu S, Carey JP, Gantz BJ, et al. Oral vs intratympanic corticosteroid therapy for idiopathic sudden sensorineural hearing loss: A randomized trial. JAMA 2011;305:2071-9. 15. Stepp CE, Voss SE. Acoustics of the human middle-ear air space. J Acoust Soc Am 2005;118:861-71. 16. Trowbridge BC. Injection of the tympanum for chronic conductive deafness and associated tinnitus aurium: A preliminary report on the use of ethylmorphine hydrochloride. Arch Otolaryngol 1944;39:523. 17. Trowbridge BC. Tympanosympathetic anesthesia for tinnitus aurium and secondary otalgia. Arch Otolaryngol 1949;50:200-15. 18. Mitchell JF. Intratympanic injection for tinnitus aurium. J Laryngol Otol 1950;64:576-9. 19. Bárány R. Die Beeinflussung des Ohrensausens durch iv injizierte Lokalanaesthetica. Acta Otolaryngol 1936:23:201-3. 20. Lewy RB. Treatment of tinnitus aurium by the iv use of local anesthetic agents. Arch Otolaryngol 1937;25:178-83. 21. Coles RR, Thompson AC, O'Donoghue GM. Intra-tympanic injections in the treatment of tinnitus. Clin Otolaryngol Allied Sci 1992;17:240-2. 22. Dodson KM, Sismanis A. Intratympanic perfusion for the treatment of tinnitus. Otolaryngol Clin North Am 2004;37:991-1000. 23. Sakata E, Umeda Y. Treatment of tinnitus by transtympanic infusion of lidocaine. Auris Nasus Larynx 1976;3:133-8. 24. Sakata H, Kojima Y, Koyama S, Furuya N, Sakata E. Treatment of cochlear tinnitus with transtympanic infusion of 4% lidocaine into the tympanic cavity. Int Tinnitus J 2001;7:46-50. 25. Sakata E, Ito Y, Itoh A. Clinical experiences of steroid targeting therapy to inner ear for control of tinnitus. Int Tinnitus J 1997;3:117-21. 26. Conlin AE, Parnes LS. Treatment of sudden sensorineural hearing loss: I. A systematic review. Arch Otolaryngol Head Neck Surg 2007;133:573-81. 27. Conlin AE, Parnes LS. Treatment of sudden sensorineural hearing loss: II. A Meta-analysis. Arch Otolaryngol Head Neck Surg 2007;133:582-6. 28. Silverstein H, Isaacson JE, Olds MJ, Rowan PT, Rosenberg S. Dexamethasone inner ear perfusion for the treatment of Meniere's disease: A prospective, randomized, double-blind, crossover trial. Am J Otol 1998;19:196-201. 29. Araújo MF, Oliveira CA, Bahmad FM Jr. Intratympanic dexamethasone injections as a treatment for severe, disabling tinnitus: Does it work? Arch Otolaryngol Head Neck Surg 2005;131:113-7. 30. She W, Dai Y, Du X, Chen F, Ding X, Cui X. Treatment of subjective tinnitus: A comparative clinical study of intratympanic steroid injection versus oral carbamazepine. Med Sci Monit 2009;15:PI35-9. 31. Denk DM, Heinzl H, Franz P, Ehrenberger K. Caroverine in tinnitus treatment. A placebo-controlled blind study. Acta Otolaryngol 1997;117:825-30. 32. Domeisen H, Hotz MA, Häusler R. Caroverine in tinnitus treatment. Acta Otolaryngol 1998;118:606-8. 33. Ehrenberger K. Topical administration of Caroverine in somatic tinnitus treatment: Proof-of-concept study. Int Tinnitus J 2005;11:34-7. 34. DeLucchi E. Transtympanic pilocarpine in tinnitus. Int Tinnitus J 2000;6:37-40. 35. Alzamil KS, Linthicum FH Jr. Extraneous round window membranes and plugs: Possible effect on intratympanic therapy. Ann Otol Rhinol Laryngol 2000;109:30-2. 36. Penha R, Escada P. Round-window anatomical considerations in intratympanic drug therapy for inner-ear diseases. Int Tinnitus J 2005;11:31-3. 37. Silverstein H, Rowan PT, Olds MJ, Rosenberg SI. Inner ear perfusion and the role of round window patency. Am J Otol 1997;18:586-9. 38. Nomura Y. Round window niche and round window membrane. In: Pfaltz CR, editor. Otological Significance of the Round Window. Advances in Oto-Rhino-Laryngology. Vol. 33. Basel: S. Karger AG; 1984. p. 27-37. 39. Yoshioka M, Naganawa S, Sone M, Nakata S, Teranishi M, Nakashima T. Individual differences in the permeability of the round window: Evaluating the movement of intratympanic gadolinium into the inner ear. Otol Neurotol 2009;30:645-8. 40. Plontke SK, Wood AW, Salt AN. Analysis of gentamicin kinetics in fluids of the inner ear with round window administration. Otol Neurotol 2002;23:967-74. 41. Banerjee A, Parnes LS. The biology of intratympanic drug administration and pharmacodynamics of round window drug absorption. Otolaryngol Clin North Am 2004;37:1035-51. 42. Bird PA, Murray DP, Zhang M, Begg EJ. Intratympanic versus intravenous delivery of dexamethasone and dexamethasone sodium phosphate to cochlear perilymph. Otol Neurotol 2011;32:933-6. 43. Becvarovski Z, Bojrab DI, Michaelides EM, Kartush JM, Zappia JJ, LaRouere MJ. Round window gentamicin absorption: An in vivo human model. Laryngoscope 2002;112:1610-3. 44. Plontke SK, Biegner T, Kammerer B, Delabar U, Salt AN. Dexamethasone concentration gradients along scala tympani after application to the round window membrane. Otol Neurotol 2008;29:401-6. 45. Borkholder DA. State-of-the-art mechanisms of intracochlear drug delivery. Curr Opin Otolaryngol Head Neck Surg 2008;16:472-7. 46. Borden RC, Saunders JE, Berryhill WE, Krempl GA, Thompson DM, Queimado L. Hyaluronic acid hydrogel sustains the delivery of dexamethasone across the round window membrane. Audiol Neurootol 2011;16:1-11. 47. Iwai K, Nakagawa T, Endo T, Matsuoka Y, Kita T, Kim TS, et al. Cochlear protection by local insulin-like growth factor-1 application using biodegradable hydrogel. Laryngoscope 2006;116:529-33. 48. Paulson DP, Abuzeid W, Jiang H, Oe T, O'Malley BW, Li D. A novel controlled local drug delivery system for inner ear disease. Laryngoscope 2008;118:706-11. 49. Sheppard WM, Wanamaker HH, Pack A, Yamamoto S, Slepecky N. Direct round window application of gentamicin with varying delivery vehicles: A comparison of ototoxicity. Otolaryngol Head Neck Surg 2004;131:890-6. 50. Sakamoto T, Nakagawa T, Horie RT, Hiraumi H, Yamamoto N, Kikkawa YS, et al. Inner ear drug delivery system from the clinical point of view. Acta Otolaryngol Suppl 2010;563:101-4. 51. Salt AN, Hartsock J, Plontke S, LeBel C, Piu F. Distribution of dexamethasone and preservation of inner ear function following intratympanic delivery of a gel-based formulation. Audiol Neurootol 2011;16:323-35. 52. McCall AA, Swan EE, Borenstein JT, Sewell WF, Kujawa SG, McKenna MJ. Drug delivery for treatment of inner ear disease: Current state of knowledge. Ear Hear 2010;31:156-65. 53. Chandrasekhar SS, Rubinstein RY, Kwartler JA, Gatz M, Connelly PE, Huang E, et al. Dexamethasone pharmacokinetics in the inner ear: Comparison of route of administration and use of facilitating agents. Otolaryngol Head Neck Surg 2000;122:521-8. 54. Mikulec AA, Hartsock JJ, Salt AN. Permeability of the round window membrane is influenced by the composition of applied drug solutions and by common surgical procedures. Otol Neurotol 2008;29:1020-6. 55. Qi W, Ding D, Salvi RJ. Cytotoxic effects of dimethyl sulphoxide (DMSO) on cochlear organotypic cultures. Hear Res 2008;236:52-60. 56. Belhassen S, Saliba I. Pain assessment of the intratympanic injections: A prospective comparative study. Eur Arch Otorhinolaryngol 2012;269:2467-73. 57. Nordang L, Linder B, Anniko M. Morphologic changes in round window membrane after topical hydrocortisone and dexamethasone treatment. Otol Neurotol 2003;24:339-43. 58. Stachler RJ, Chandrasekhar SS, Archer SM, Rosenfeld RM, Schwartz SR, Barrs DM, et al. Clinical practice guideline: Sudden hearing loss. Otolaryngol Head Neck Surg 2012;146:S1-35. 59. Duckert LG, Rees TS. Placebo effect in tinnitus management. Otolaryngol Head Neck Surg 1984;92:697-9. 60. Langguth B, Salvi R, Elgoyhen AB. Emerging pharmacotherapy of tinnitus. Expert Opin Emerg Drugs 2009;14:687-702. 2 Intratympanic bupivacaine instillation for tinnitus treatment?